Roger Baxter joined Acacia Investigations in 2009 immediately after his retirement as a State Police Detective from the Connecticut Department of Public Safety after a twenty- five year career. He served in the Bureau of State Fire Marshal for nineteen years as a Fire Investigator in the Enforcement and Investigation Unit. Additionally, he was an accelerant detection canine handler for eighteen of those years. 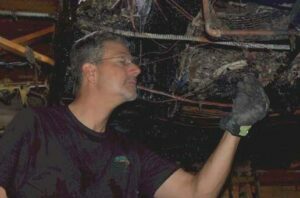 Prior to his service in the Connecticut State Police, Roger received vocational training as an electrician. Throughout his career, Roger has attended numerous courses in fire investigation, expert testimony, and amusement ride safety and inspection. He is certified by NAFI as a Fire and Explosion Investigator, IAAI Certified Fire Investigator, CT State Certified Fire Marshal/Fire Investigator and NAARSO Level III Inspector with Instructor Endorsement for Amusement Ride Inspection. Roger also has an extensive training background as an instructor and has taught fire investigation and expert witness testimony in the Connecticut Fire Marshal’s Certification Course, Fire Marshal In-Service Training and the Advanced Fire Investigation Course for the State Fire Marshal’s Office. He has also taught fire investigation at the Connecticut Fire Academy, Connecticut Police Academy, Three Rivers Community Technical College, Connecticut State Police Citizen Academy, University of New Haven and Saint Anselm’s College. Roger Baxter has testified numerous times as a fact and expert witness in both civil and criminal depositions and trials. He is a member of many professional organizations including the Connecticut Fire Marshal’s Association, International Association of Arson Investigators, National Association of Fire Investigators, New London County Fire Marshal’s Association and is Past President of the Windham County Fire Marshal’s Association. Roger is an experienced and dedicated fire investigator, who searches, gathers and articulates the facts of a case in a truthful, understandable and professional manner. Roger holds a full Private Investigator license in Connecticut and Massachusetts. Roger purchased Acacia Investigations in January of 2017.